Our portable basketball goals are made here in the USA. 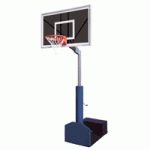 Perfect for any high school gymnasium of indoor recreation facility. The Fury, Thunder, & Rampage models can also be used outdoors.